Campaign Limited by Budget is a campaign status in AdWords. It indicates that your daily budget is lower than the AdWords recommendation. When campaigns are limited by budget, Google might not trigger ads from that campaign as often as they could. How to check Campaign Limited by Budget status? You can check Campaign Limited by Budget status in the status columns of campaign report table. Campaign report table has information about all your campaigns, their status and more. 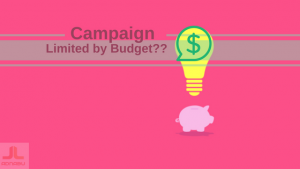 Why is a Campaign Limited by Budget? When a campaign has a budget which is lower than the amount that Google recommends, it is possible that the budget is insufficient to accommodate all the traffic that is available for the keywords in that campaign. The budget shortage can also affect different targeting settings attached to that campaign. AdWords reduces the number of ad impressions to maintain your budget so that it lasts all throughout the day. Ad impression is the number of times your ads match user search queries and show on Google. A campaign with a limited budget can still be successful by meeting all your business’s strategic requirements. However, there could always be a scope of gaining more exposure. The exposure can be in the form of impressions and clicks if you can increase your daily budget. More significant exposure can lead to higher number of conversions. How to fix Campaigns Limited by Budget? In the campaigns table, click on “limited by budget” to learn what kind of exposure your campaign could receive if you use a higher budget. If you can’t increase your daily budget, you can consider reducing the bids in the campaign with a limited budget. If you are using automated bid strategies, you can lower those bid adjustments to try and accommodate more number of clicks or video views within your budget specifications. Learn more about Google AdWords on our AdWords and PPC blog.